American Pig Skin is big. Some say football has become America's real past time, instead of baseball. Channels like ESPN and NFL Network cover American Football year round. It has become a very popular sport in the U.S.
What if I told you that the players who played and made football what it is are going through brain issues? What if I told you several concussions throughout a NFL player's career contribute to brain diseases? A former QB from the Bears constantly writes reminders because he forgets everything. A former LB drafted for the Chargers committed suicide and his brain was discovered to be diseased from concussions. Knowing this, knowing that if your son puts on a helmet and pads, he is running the risk of concussions and brain problems, would you let your son, your own child, play American football? European people on here can weigh in if they like. American football or Rugby - short answer: yes. But it'd be up to them. I wouldn't mind if my son played football, if he so desired. My gf said she would not let any child of hers play football. She thinks it's too dangerous and wouldn't want to see him get hurt. Up to them. If they turn it into a passion then I'll act as a parent and root for them while attending their games with the best of my abilities. Driving kills over 2000 people a year in the U.S., doesn't mean I'm going to not let my child drive. Just because in some cases it has been found to be the case of brain damage, it would still be up to my kid to decide. Yep. I wouldn't oppose his choice to participate. Absolutely. I'll explain to them the risk of playing, but the rewards as well. This reminds me of a south park episode Sarcastaball. If your child wants to play a physical sport i think there is nothing wrong with that. My brother is 12 and he's actually just started taking boxing lessons. Sure if they want I'm not stopping them. Yes its a great learning experience of team work and life. If they like I’ll let them to play. No. Would rather my kids play football. I gave USA football a try at primary school, it was OK but couldn't get the hang of the rules. Holy carp its complex. A few years later when at secondary school the same guy showed up to teach us basketball. Terry was his name he was an American. Surprises me I remember his name after all these years. Cheerleading is more dangerous than playing football. If I had a son instead of a daughter, yes, I would let him play football. 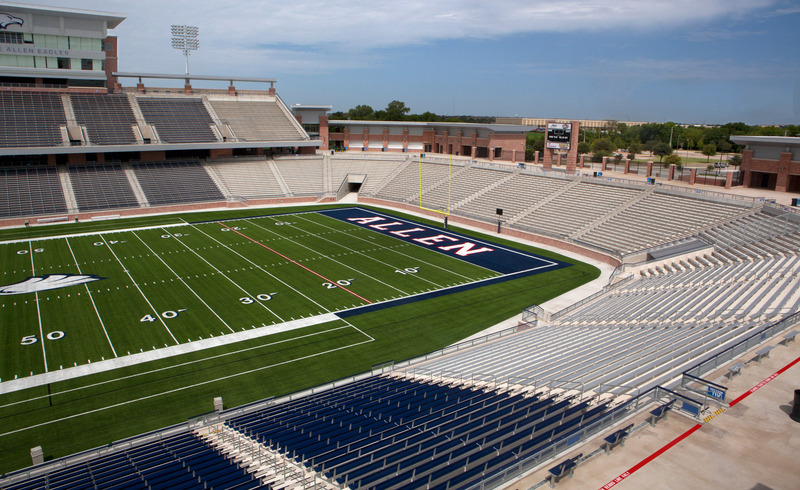 But then again, I live in Texas, and NOBODY loves high school football as much as Texans do. 2012 5A Division 1 State Champions. In 2008 they were ranked #2 in the nation. They also have the worlds largest high school marching band and drill team. The Allen Eagles Escadrille Team is an amazing sight all by itself. They've marched in the Rose Bowl Parade several years and were even invited to Dublin, Ireland to march in the St. Patrick's Day Parade there. Yes i would if they liked playing it and they were lucky enough to be very good at it then you never know. Yep, it's their choice.. My middle two both played rugby (union) when they were younger and before we moved to where we live now. The both play football (soccer) for the village team here. Played rugby myself as a kid up to youth level (22).. I'd absolutely let my kids play football or any other sport if they wanted to. Unfortunately, they inherited their father's athletic ability so....video games, it is!